As you may know, your neck and entire spinal column houses and protects your spinal cord, all the way from the base of your skull to your low back. At each vertebral level of your spine, nerves exit your spinal cord and branch out to feed the muscles and tissues of your body. These nerves have many functions, they send signals of sensation so we can perceive things such as pain and touch, and they also send messages down from the brain to recruit muscles and allow other bodily functions to take place. When nerves are compromised for any reason, their abilities to send signals to and from the brain are compromised as well. Exiting from the neck from your C5-T1 levels comes a large network of nerves that feed into and power your shoulders and arms. This network of nerves is called the Brachial Plexus and sits directly behind your collar bone (clavicle), in fact one of our clavicle’s main purposes is to protect this important bundle of nerves. The brachial plexus passes directly between your Scalene muscles. 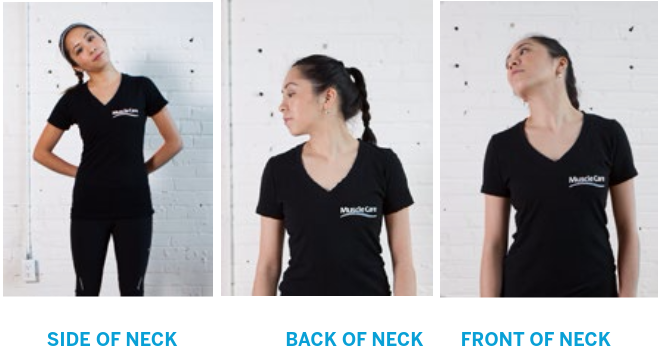 There are 3 scalene muscles on each side of the neck attaching from the 3rd to 7th cervical vertebrae and onto your first and second rib. When a nerve or plexus passes between or under a muscle it is prone to being pressed, pinched, and compromised. This happens very often with the scalenes as many of us hold tension here. This group of muscles can become tight when we look down at phones or computers, read in bed with our necks flexed, or develop joint restrictions from poor postures. As these muscles pinch the nerves it can lead to mixed signals back to the brain. These mixed signals come in the form of pins and needles, numbness, pain, cold hands, and further tightening of our muscles. By avoiding the poor postures that developed the tension and stretching these muscles you can begin to alleviate tension and nerve compression. See below for a diagram of the scalenes and brachial plexus as well as some easy stretches for the scalenes. Hold each stretch for a minimum of 30 seconds, both sides, and keep it gentle and pain free. If pain, numbness, or temperature changes continue in your hand, arm, or shoulders, come see one of our Chiropractors or Physiotherapist at our Yonge and St. Clair Clinic. © 2017 Oswald Chiropractic Professional Corp, All Rights Reserved.